Been having thoughts about bringing it back to life again, but Im afraid the old discussions about rules, LOS (lineofsight) and Cover would come back as well. Thanks for the praise, it's much appreciated by all of us over at tUGS and motivates us to keep up what we're doing. Have you read the article Gorkamunda? Or did you mean the other way around, putting Orks in Necromunda? When we're working on rules we try to always remember that the most important thing is that the finished product has to be fun. This is carried over to when we're playing - we play to enjoy ourselves, not simply to win, so as long as lines of sight are about right, it's fine. When I think about it, most of the time we find cover grants -2 to hit, although occasionally there's light cover but it's very much in the minority. Nice chart, I can see it being a handy reminder. I've been talking to Mortis about getting some GorkaMorka going sometime soon so I'll have to get a couple of these printed off. 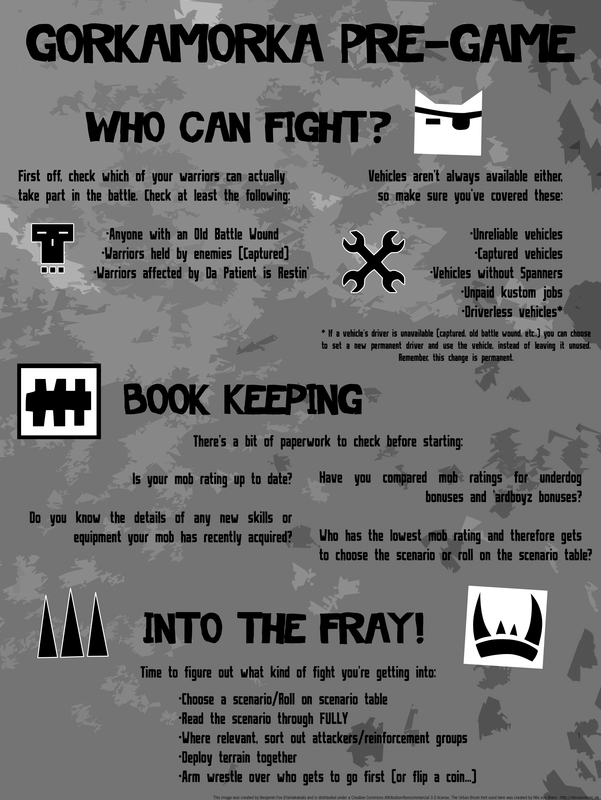 The content for a post-game one has been drawn up, but I've not got around to doing the graphic for it yet as I've been working quite hard on our new GoMo faction, the Dust Rats.